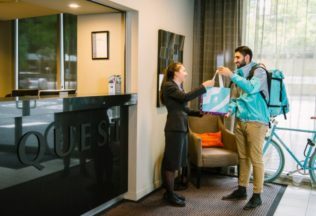 Visitors at select Quest Hotels across Australia are now able to order Deliveroo through room-service thanks to a new partnership. Offered at 12 Quest hotels to begin with, Quest will provide a printed Deliveroo menu in-room and customers will be able to order by calling reception. After placing their order, guests will have their food delivered to their room within 30 minutes and the bill can be paid at reception at the end of their stay. The service will be rolled out to all Australian Quest Hotels where Deliveroo is in service by the end of 2018. Food available through Deliveroo includes Zambrero, Nandos, 8Bit and Ribs & Burger. Craig Ryan, Chief Commercial Officer at Quest, said offering Deliveroo will help Quest keep up with the demands of the modern business traveler. “As the fastest growing hotel brand in Australia, and the largest apartment hotel brand in the market, it made sense to partner with an equally fast growing brand like Deliveroo,” Ryan said. Levi Aron, Country Manager of Deliveroo, said partnerships with Deliveroo are a great option for hotels without an in-house restaurant. “Customers enjoy the convenience of at-home delivery, so it’s great to be able to broaden our on-demand offering and deliver amazing food straight to their hotel door,” Aron said.